Enterprise Portals are cutting-edge technologies that enhance business to business (B2B) communication, streamline financial operations and optimize costs. There are four key components to any portal: content delivery, user interface, portal management and web services. A key feature of enterprise portals is the de-centralized content management, which keeps the information always updated. Through UI design. We use JSF, jQuery, Icefaces, Spring MVC and Wicket to develop a fully-fledged enterprise portal. For flawless performance, using SLA. We provide preventive maintenance, upgrades & enhancement and 24x7 Support. Embracing the latest trends in business and technologies, Fullestop delivers a set of end-to-end Enterprise Portal Development service to its clients. 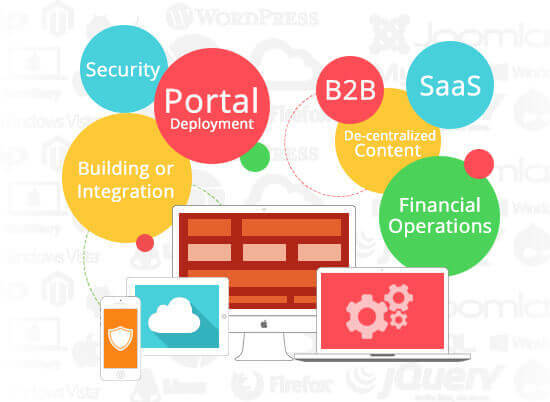 We build enterprise portals that are cloud based, software-as-a-service (SaaS) and mobile friendly to provide online services using Single Sign-On facility. We focus on preserving the operation and integrity of 3rd party or legacy applications, thus provide an interactive model to integrate existing applications into the Portal System. With nearly 13 years of experience of developing web applications and portals, Fullestop has a skilled team which has expertise across multiple technologies and platforms for the development of Portals and Web Applications. With Fullestop Enterprise Portal Development, your organization can make effective use of the content /data/ information that you already have. How to take forward: Talk to us, let us know more about your challenges. We are more than glad to share our expertise and provide right solutions.